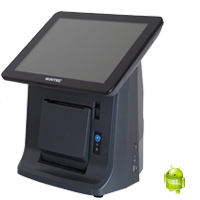 AnyPos 100 is an all-in-one compact POS with built-in thermal printer and customer display. With 9.7″/12.1″/15.6″ capacitive touch screen, AnyPos 100 largely saves space and makes the machine easy to manage. AnyPos 100 is an all-in-one compact POS with built-in thermal printer and customer display. With 9.7″/12.1″/15.6″ capacitive touch screen, AnyPos 100 largely saves space and makes the machine easy to manage. Powerful Intel or ARM processors support latest OS and help operations run smoothly and fast. It is ideally suited to the most diverse range of markets in traditional.